I am teaching another class in January. More info coming soon. Not sure how much it will cost, but they are usually very affordable or no charge. Wed. 1/28/09, 6:00 – 8:30 pm. Will be in conjunction with the Burgaw Chamber of Commerce. We will probably hold it at the CFCC Burgaw Campus, 100 E. Industrial Dr. Burgaw, 28425. ‘New Technologies for Small Business & Personal Use’. – Learn about the latest technology, gadgets, web sites, etc. that you can use to improve your business and personal interactions. Topics will include such things as wireless internet, Blackberry technology, Iphone capability, iGoogle, twitter, web site ad placement, etc. This entry was posted in CFCC, Technology on December 12, 2008 by TGK Admin. North Carolina Biotechnology Center’s President and Chief Executive Officer Norris Tolson and Southeastern Office Director Randall Johnson, spoke on how biotechnology drives North Carolina’s economic development at the Brunswick County Entrepreneurship Conference held on April 10th and 11th in Sunset Beach, N.C. Some of the topics discussed were expanding the production of natural products, growing algae to produce biodiesel, marine fish farming and practical applications of marine biotechnology. According to Johnson, entrepreneurship, expanding existing business and recruitment are three equally important components to economic development. “The key is to start the business here and it will grow. The big question is how to move the ideas from the mind to the marketplace‚” said Johnson. This entry was posted in Biz Journal, Entrepreneurship, Technology on April 15, 2008 by TGK Admin. Verizon Wireless’ Wilmington call center is expanding and will hire 150 new full-time customer service professionals as part of its plan to expand its operation and support increased demand for its wireless products and services. The company plans to hire approximately twenty-five new employees per month through November 2008. Verizon Wireless currently employees more than 1200 people in the Wilmington area in their customer service, information technology, training and financial services departments; it also has two full-time employees and two interns in the fitness center. Clayton also commented that he started eleven years ago as a customer service representative and has since advanced to his current position in management. This entry was posted in Biz Journal, Technology on March 16, 2008 by TGK Admin. McKim & Creed wins design award for website. McKim & Creed, a engineering firm, started in Wilmington, with an office in downtown Wilmington, won the 2007 Construction Writer’s Association (CWA) for best website. CWA a non-profit organization for professional journalists, writers, editors, and publicists serving the the construction industry and presented a total of three national awards this year for electronic communications. Web sites are judged on criteria such as quality of content, overall design and use of innovative and accessible technology. The number one challenge for this industry is hiring and retaining good people and this site helps attract quality employees, especially recent graduates, said Pete Kienle, Chief Marketing Officer McKim & Creed and past national president for the Society for Marketing Professional Services. Kienle stated that the firm has put a greater emphasis on their online presence than most of their competitors and that more employees are increasingly using the web to research employment. “Most firms in this industry would not have spent as much money and time on their website but we felt it was money well spent, the owners are thrilled to death,” said Kienle. The firms has also hired a full time person to administer the site and create a company intranet and used video of staff throughout the site. The website (www.mckimcreed.com), launched in July 2007 and was built by Signal, a design, marketing, and technology firm with offices in Wilmington and Raleigh. The website includes a custom-built content management system that enables McKim & Creed staff to update key portions, add pages and content to the site, said Bryan Kristof, Director of Marketing for Signal. “McKim & Creed was easy to work with because they already understood the design and construction process.” Since the award, there has been “huge activity” on the site, said Kienle. This entry was posted in Biz Journal, Entrepreneurship, Technology on February 19, 2008 by TGK Admin. I am still testing out OS X 10.5, and in the process need to ensure that once I convert my laptop I will still be able to sync my Nokia E70 with it.Out of the box, OS X 10.5 does not sync, but a simple install of the official Nokia iSync plugins adds the functionality back. So far the calendars, contacts and todos sync without any big problems. One todo from the phone, that was set to not have a due date, was imported with a 2015 date, but that is not a real issue. Download the iSync plugin from Nokia. This should work with any of the phones listed on that page. 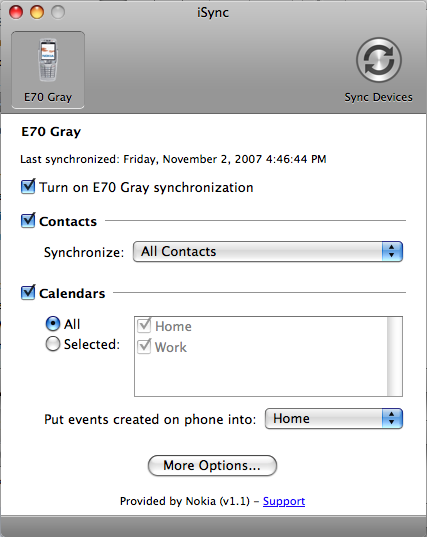 This entry was posted in Mobile Phones, OS X 10.5, Technology on November 2, 2007 by TGK Admin. On Wednesday night, I traveled to Chapel Hill to get a head start on the drive to CED’s annual Tech Conference. The conference was great, but that is another story. While sitting in a friend’s yard, we were interrupted by the Carrboro police looking for someone who had called 911. 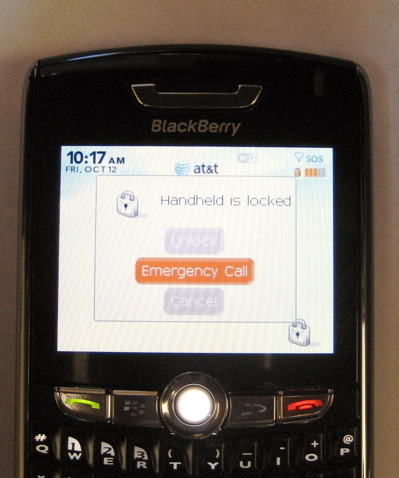 I guess some brain trust at RIM decided that instead of accidentally calling your brother or mother-in-law and leaving a garbled message on their voicemail, your phone should be able to accidentally call the police by sitting on your phone. The best part is that since the 911 dispatcher has access to the triangulation information from the cell towers, they are able to find your withing a couple of hundred feet. The officers were understanding but I could imagine a time when they would not be so interested to learn about the technical reason you made a call to 911. This entry was posted in Mobile Phones, Technology on October 12, 2007 by TGK Admin.